This is a very simple recipe for orange chicken. Boneless chicken breast recipes make a busy life so much easier. They are cooked in 20 minutes or less and there are so many ways you can cook them. In a 10 inch skillet, heat butter until bubbly. Add the chicken breasts and cook until they are browned on both sides. Remove them from the skillet and set aside. In same skillet, cook the mushrooms over medium high heat, stirring occasionally, until all the liquid has evaporated. Sprinkle the mushrooms with flour and stir quickly to combine. Gradually stir in the water. Add the orange juice and broth mix. Stirring constantly, bring it to a boil. Reduce the heat, add the chicken and let it simmer for 3 to 5 minutes, to allow the flavors to blend and the chicken to finish cooking. In the last minute of cooking, add the chopped scallions, parsley and mandarin orange sections and allow them to heat through. 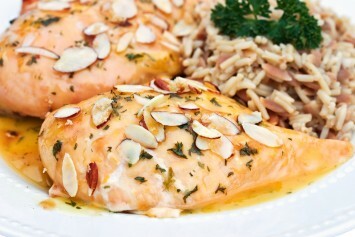 Serve the chicken breasts sprinkled with the chopped scallions and almonds and topped with the orange sections. This orange chicken recipe would be great served alongside cooked rice and our asparagus with orange butter sauce. 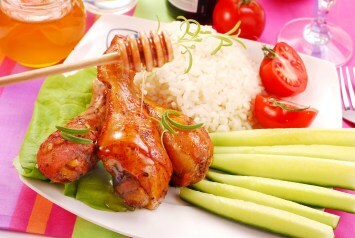 Chicken is versatile because it is mild in flavor and works well with such a wide variety of flavors. This quick and easy orange chicken recipe uses orange juice as a sauce that the chicken cooks in. The almonds topping the chicken for serving add a nice crunch and the chopped scallions have a tiny bit of kick. If you want the scallions (or green onions) cooked just a bit, add them to the chicken and sauce mixture for just the last minute or two of cooking time. From start to finish this dish is ready in under 1/2 an hour, a great 30 minute meal idea. While the chicken is cooking, cook up some rice. I like to cook the rice in some chicken broth for extra flavor. This is a fairly good diabetes recipe. The carb count is pretty good, and it’s a great diabetic recipe for entertaining. I hope you enjoy this recipe. Use the form below to let me know. And if you do enjoy the recipe, don’t forget to like it on Facebook and pin us on Pinterest. Find more tasty chicken recipes here.